CEBU’S rising junior cyclist Luis Miguel “Igimax” Maximo of YKK Bikes joins the Philippine National U-23 and junior teams to represent the country in the 19th Asian Junior Cycling Championships starting today until Feb. 18 in Kuala Lumpur, Malaysia. 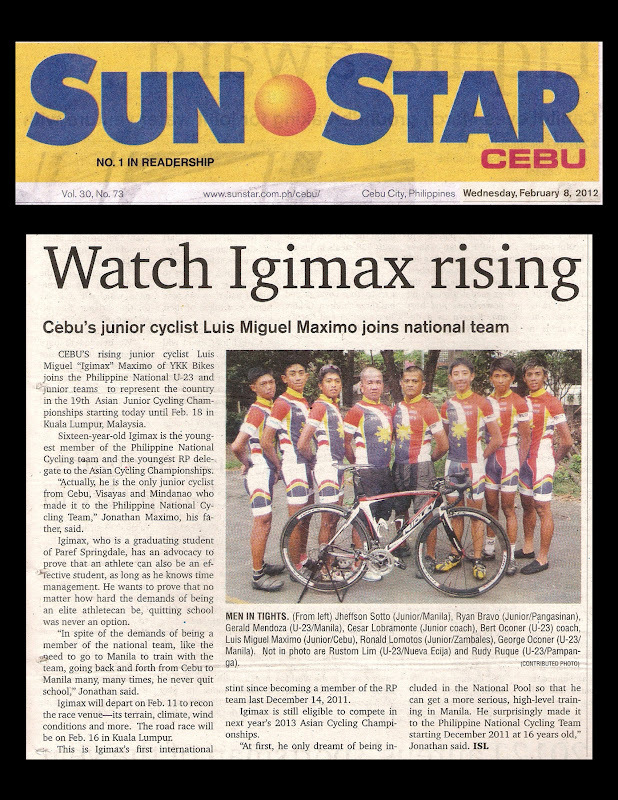 Sixteen-year-old Igimax is the youngest member of the Philippine National Cycling team and the youngest RP delegate to the Asian Cycling Championships. “Actually, he is the only junior cyclist from Cebu, Visayas and Mindanao who made it to the Philippine National Cycling Team,” Jonathan Maximo, his father, said. Igimax, who is a graduating student of Paref Springdale, has an advocacy to prove that an athlete can also be an effective student, as long as he knows time management. He wants to prove that no matter how hard the demands of being an elite athletecan be, quitting school was never an option. “In spite of the demands of being a member of the national team, like the need to go to Manila to train with the team, going back and forth from Cebu to Manila many, many times, he never quit school,” Jonathan said. Igimax will depart on Feb. 11 to recon the race venue—its terrain, climate, wind conditions and more. The road race will be on Feb. 16 in Kuala Lumpur. This is Igimax’s first international stint since becoming a member of the RP team last December 14, 2011. 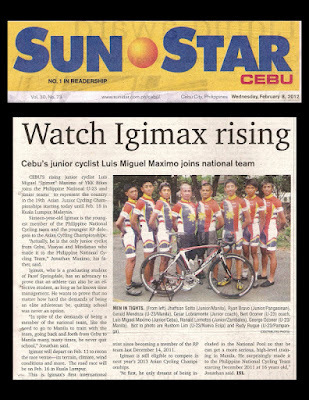 Igimax is still eligible to compete in next year’s 2013 Asian Cycling Championships. “At first, he only dreamt of being included in the National Pool so that he can get a more serious, high-level training in Manila. He surprisingly made it to the Philippine National Cycling Team starting December 2011 at 16 years old,” Jonathan said. Published in the Sun.Star Cebu newspaper on February 08, 2012.